A letter signed by doctors, lawyers and teachers has been sent to every politician in Queensland. Teachers, doctors, lawyers, social workers, domestic violence prevention professionals and women's organisations have signed a letter asking Queensland's parliament to be on the "right side of history" this month and vote for abortion to be decriminalised in the state. Sam Pidgeon is vice president of the Queensland Teachers' Union, one of the letter's signatories, which represents more than 45,000 teachers in the state. "We think [medical professionals] should be able to go about their work unhindered by the spectre of criminal charges, and we take the view as a union that women are seeking a health service and won't ever be able to take up an equal role in society if they can't make safe and legal decisions about their fertility," Pidgeon told BuzzFeed News. Abortion is illegal in Queensland under the state's Criminal Code and a termination only becomes lawful if it is to "prevent serious danger to the woman's physical or mental health". The proposed legislation, introduced by the state's Labor government and to be voted on later this month, would take abortion out of the Criminal Code. The procedure would instead reside in health legislation, where it would be available to a woman up to 22 weeks gestation, after which she would require two separate doctors to approve the procedure. The letter has been sent to every politician in Queensland's parliament. Pidgeon said the union's members, of whom the majority are female, could be found in "every single region of Queensland, even in one-teacher schools". "Our members have told us there is a real challenge for women in remote and rural areas in particular in terms of being able to access safe and affordable options when it comes to making decisions about their own fertility." The union also strongly supports the section of the proposed law that would establish "safe zones" around abortion clinics to protect patients from being approached by picketers. "These patients and all the workers at these clinics should be able to arrive at their workplace without fear of harassment and intimidation," she said. 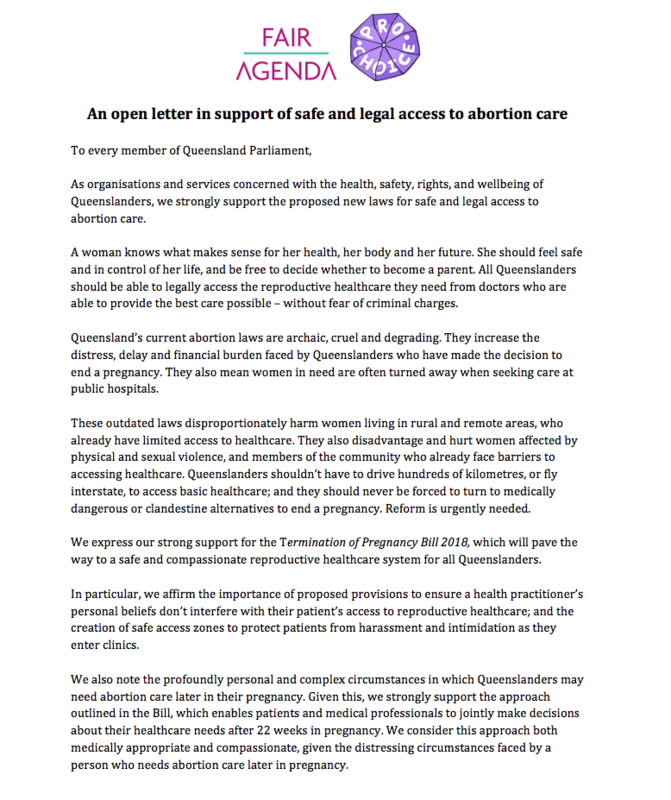 The letter condemns the current laws in Queensland as "archaic, cruel and degrading", and says the laws increase the "distress, delay and financial burden" faced by anyone terminating a pregnancy. "Why is abortion union business?" Pidgeon asked. "Because equality is union business and we want the capacity for all women to participate equally in society." Medical organisations that signed the letter include Cairns Doctors, the College of Medicine and Dentistry, Rockhampton Women's Health Centre, True Relationships and Reproductive Health, Salisbury Day Hospital and Logan Women's Health and Wellbeing Centre. 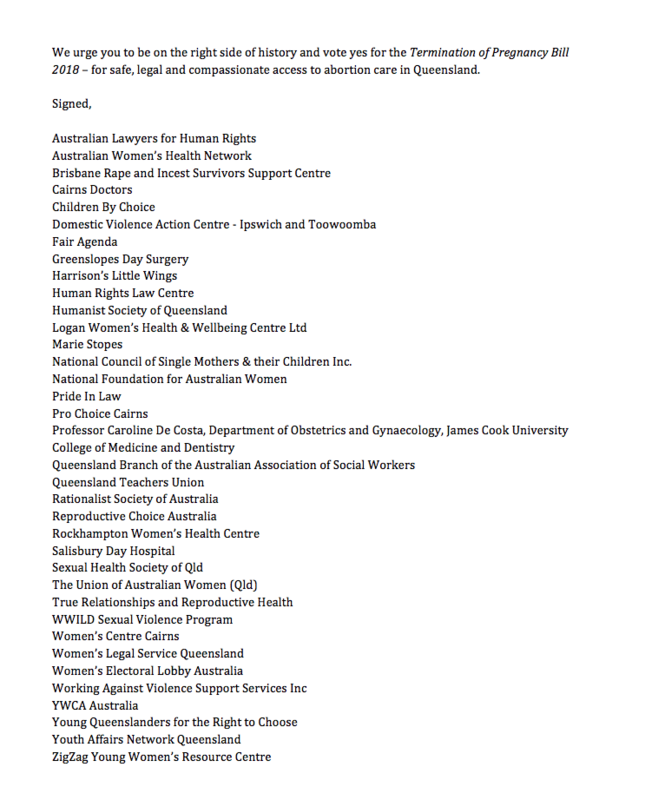 Legal organisations including Australian Lawyers for Human Rights, the Human Rights Law Centre and the Women's Legal Service Queensland also signed the letter.